Criticism or Encouragement–Which One Will You Believe? Perhaps if we’re friends on Facebook, you recall this status from me on January 29th, the day after 18 Truths came out . . .
After some much needed encouragement, a nap, and some chocolate, I pulled myself together and pressed on. Good thing too, because just 3 weeks later, this happened after my publisher ran a BookBub 99 cent Kindle deal for my first book, 18 Things . . .
That’s #114 in the whole Kindle store!!! Almost crossed “Make it to the top 100 of Amazon” off my bucket list. Sooo close. 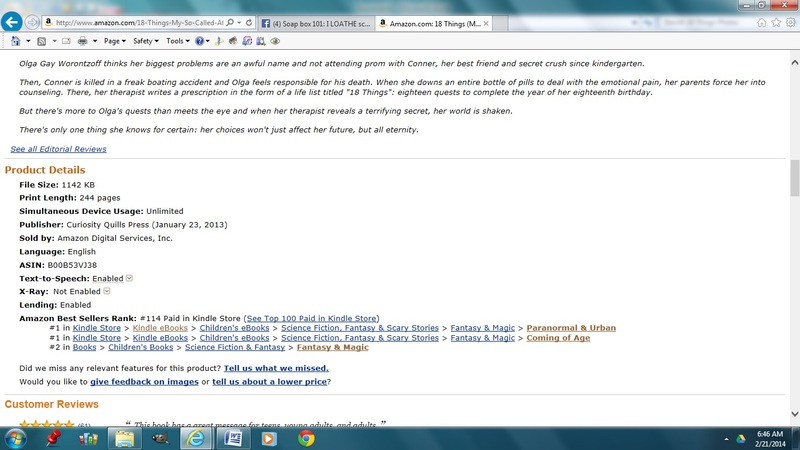 And I was #1 in Children’s Paranormal, #1 in Children’s Coming of Age, and #2 in Children’s Fantasy . . . I really liked that one because I found myself in a Suzanne Collin’s sandwich (Catching Fire was #1 and Hunger Games #3). The trend continues! Both of my novels are still trending in those first two categories. But with success comes a great feeling of vulnerability. Envy happens from people you thought you could trust, people in the industry and even people who aren’t. Yep, I’m finding my own personal set of 18 Truths inside Lysa’s book. Have you ever had a friend who was the exact opposite of what you need? She/he put down everything and everyone in your life, under the disguise of trying to be helpful. *Raises both hands high in the air* I’ve kept some of these relationships alive because I felt like they’re probably the only people being honest in my life, but why do I give them such control? I wrestle with enough negative influences in my world without being bombarded by them in my so-called friendships. So I finally realize I need to discontinue some relationships because I’m beginning to be influenced in a negative way toward things. Instead of me appreciating the blessings of this journey, these people were leading me to focus of the few things that were wrong. That’s not how I want to live my life. It was actually a story titled How the Brain Takes Criticism I saw on CBS Sunday Morning show that lead me to severe these relationships (check out the article if you have time). That, and the sudden loss of my twelve-year-old student last week. Life is simply too short to feed the negative. “Realities based on runaway feelings rather than truth always lead to one thing–insecurity” I AM GOING TO PUT THAT ON A T-SHIRT AND WEAR IT EVERYDAY! That was me yesterday … runaway feelings! Ug. I got over them later and have decided not to give up on something I want. Yesss! Let’s get matching T-shirts! There are enough Blessings from God for everyone. Congratulations on that ranking!! When my publisher ran the BookBub promotion for my book last month, I was blown away by the results. Doesn’t the top two hundred feel good? Think of all the young people who will be touched by your book now. I’m a firm believer that God will top any dream we could ever have for ourselves! That’s amazing, Jamie! WTG! BookBub sure does bring in results, right? I’m hoping to get an ad with them at some point. But you know what, you’re so totally right to let that person go. There’s just no room in our lives for anything negative. At all. I recently let go of an age old friendship for similar reasons. I’m at an age where if it’s not working, it’s not working and it’s ok to let go of it. There are so many peeps who come and go in our lives, and as long as we’re being the person we want to be, then that’s what’s important. Some peeps won’t get that. And those are the ones we don’t need in our lives. Encouraging post, Jamie! So sorry to hear about your student. Makes my heart hurt. LOL . . . thanks for making me laugh, Mom 😉 And I highly doubt that! Congratulations on your success and wishing you so much more. While I know the criticism hurts, just remember there are SO MANY MORE out there that enjoy and appreciate all your hard work. And it’s that so many more that makes this journey worth it! Congratulations! Glad you survived the Negative Nellies too. Awesome. There are author killers out there, and there are true and genuine pals. I think we have to be careful which voices we listen to, but we also have to be prepared to hear some things we don’t want to. No great movement has ever gone forward without some opposition. It makes us strong. You are wise beyond your years, Crystal! Good for you for getting past that would-be detractor. It’s a skill to learn how to not care about what other people think of oneself, and to ignore criticism coming from a very dark place. I don’t regret at all pulling the plug on my friendship with my ex-roommate. While I don’t think she’s a bad person, she’s not at a happy, stable place in her life, and probably hasn’t been for quite some time. I didn’t need her lecturing and yelling at me about every little thing just because she’s so unhappy, emotionally and psychologically unstable, and probably using her extreme crunchiness and Orthodoxy as some kind of crutch to compensate for God knows what in her past. Wow, congrats on the ratings 🙂 Once we attended a boring work conference and learnt that some people are radiators and some people are drains – ditch the drains! Some people just like to pick fights or provoke some kind of reaction. Or they’re just jealous. Adulthood can sometimes be an awful lot like high school. 😦 Chocolate and positivity always helps, though. You did amazing with your BookBub ad! Congratulations! That is so fantastic… I’m totally excited for you and it’s very well deserved. It’s about having faith in yourself and patience… two things i need to learn more of too. Sorry to hear you’ve had such a rough ride. Glad the blog ended on a positive note though. Congratulations at getting to 114! And thanks for sharing my obsession with Elsa from Frozen. I know all the words to that song now – if only I could sing! Wow Jamie! I’m so proud of you for severing those toxic ties. Sometimes we’ve been friends with someone so long it’s hard to be so objective (just like our own writing…eek). Congrats on the ranking! Super! I have to promise myself that when the time comes to let my work out into the world never to let the numbers and the feedback, both good and bad, sway me from my course. Part of that promise is disengaging from people and places that make me think I should stop writing. Huge congrats on being the meat in a Collins sandwich! Your message rings so clearly in your stories that you were bound to rise to the top if you persevered. I am so glad you are a stronger person from all that has happened and are doing what is right for you. I have found myself pulling away from those that don’t make me a better person or a stronger one through the hard parts of life. Too bad some people are like bad colds and linger. Oh well. You are amazing!! What a healthy reaction Jamie. Glad you (re)found the strength you needed. People are weird. But mostly wonderful.